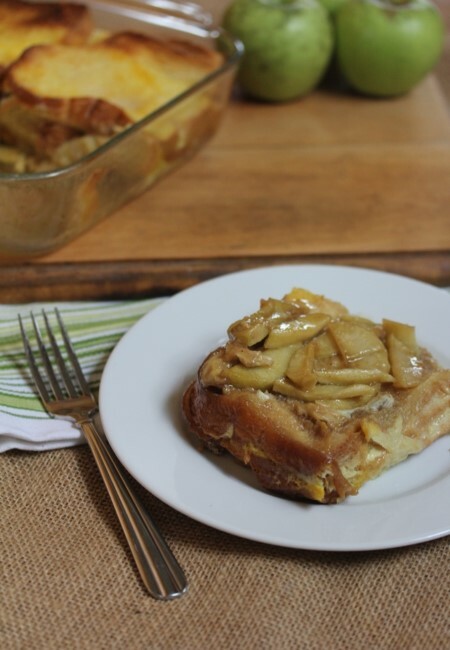 This simple breakfast of overnight oven apple french toast can be made ahead and baked in the morning for a delicious breakfast your family will love. I have been making overnight french toast for years. It is one of my favorite breakfasts to make on the weekends and holidays. 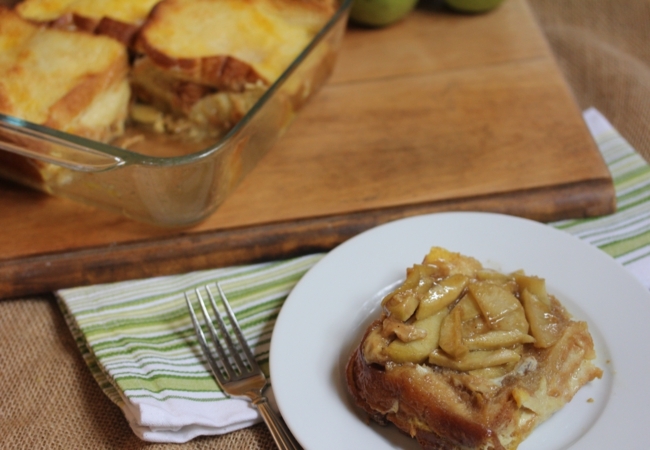 So, when I saw an Overnight Apple French Toast recipe in a cookbook recently I knew it would be perfect for my Cooking Through My Collection series. I am so glad I tried this recipe. It will be going on the menu plan often and will make a great fall breakfast. This recipe comes from the cookbook The Best of the Best from Oregon. I have several of the Best of the Best cookbooks and I love them because they remind me of the old fashioned church cookbook type books. Church and community cookbooks are some of the best cookbooks because the cooks are everyday people that love to create food that is family and budget friendly. The Best of the Best from Oregon might be my favorite of the Best of the Best cookbooks. I think that is due to the fact that I was raised in Oregon. When I look through this cookbook I am reminded so much of the recipes I grew up eating. The type of recipes my mom and her friends used to make. I think my favorite recipes from the book are the desserts. More specifically the desserts that use fresh berries and apples. Oregon is known for its fresh berries and I grew up picking and eating all kinds of them, so I love finding recipes that use them. I have tried quite a few recipes from this cookbook, but the recipe I am featuring today might be one of my favorites. 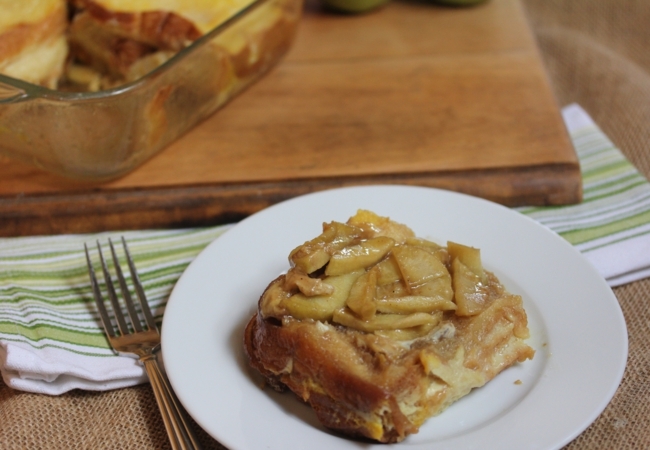 My family loved this and it was a great way to use up some apples that I had on hand. This does need to be made ahead so you have to plan ahead, but make ahead breakfasts are great for busy mornings and relaxing weekends. In a pan cook brown sugar and butter over medium heat until butter is melted. Add water, apples, and cinnamon. Cook over medium to medium low heat until apples are slightly tender and sugar is dissolved. Pour mixture into a 9×13 pan. Let cool for about 10 minutes. 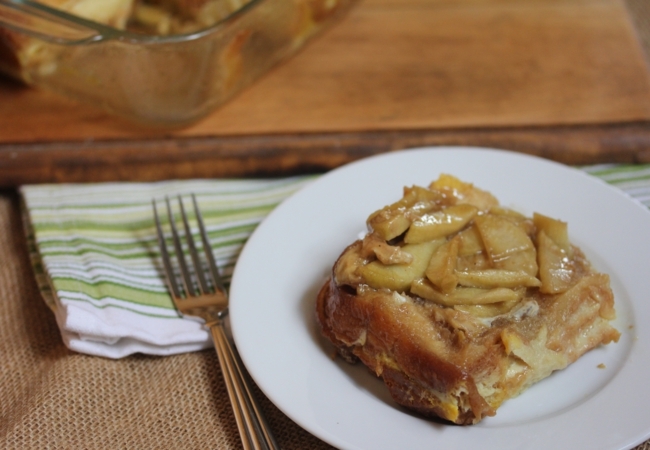 Place bread slices over apple mixture. In a bowl combined eggs, milk, and vanilla. Whisk until well combined. Uncover and bake at 350 for 45-50 minutes. I assume you put down two layers of bread? That’s what it looks like in the picture and I know 12 slices wouldn’t fit in a single layer on the bottom of a 13 x 9. Yes, I did two layers since I used basic sandwich bread. Yes and I just fixed it. Thanks for letting me know! Have you ever made this with berries or peaches? Not this exact recipe, but the same basic idea. Peaches or blueberries are both very good!